Disney's live-action remake of the 1993 classic "Aladdin" will hit theaters in May 2019. The 2-3 Philadelphia Eagles (ouch) will take on the 1-4 New York Giants on Thursday night at rainy MetLife Stadium in what could be a make-or-break game for the defending Super Bowl champs. If for some unforeseen reason this goes awry early on (Philly is 12-4 against the G-Men this decade) make sure you don't shut off the TV in disgust. FOX has a treat for Disney fans. A promo for Thursday Night Football had a little segment tacked on at the end promising a first look at Disney's upcoming live-action remake of "Aladdin." The teaser trailer aired just before halftime. 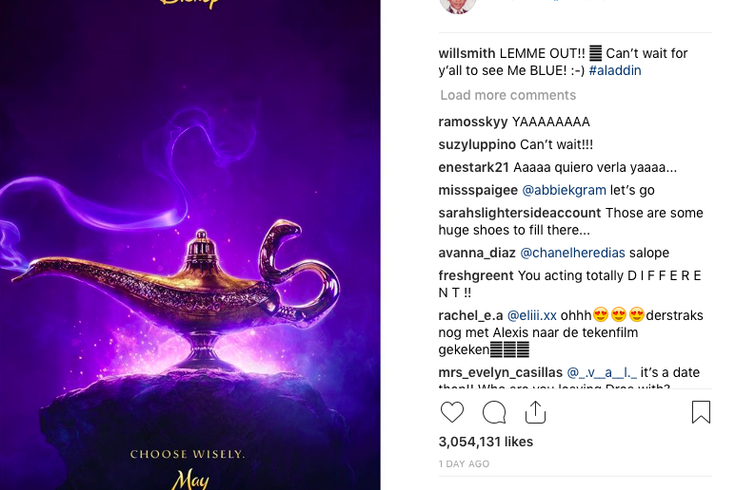 The Guy Ritchie-directed film, due out in May 2019, is of particular interest to Philadelphians because Will Smith is filling Robin Williams' massive shoes as Genie. Casting for the iconic role was a subject of intense speculation during the movie's early development, so much so that it appeared to boil down to a tiebreaker between Smith and fellow Philly-native Kevin Hart. (That wasn't of much concern to Disney next to accusations of whitewashing in the rest of its casting search). Smith also teased a poster for the film on Instagram on Wednesday, suggesting we're in line for a lot more promotion over the final months of 2018. .Philly is going to burn its first wish on getting back to .500, unless Big Willie Style has a freebie for us.